The Real Jedi Mind Trick? Sadly … well, perhaps thankfully … real persuasion is not so simple. There are, however, some legitimate ways to “hack” into the minds of the unaware and literally “install” beliefs. If you think that’s bulls*** I offer the following as proof: the entire fields of Public Relations, Advertising, and Marketing. 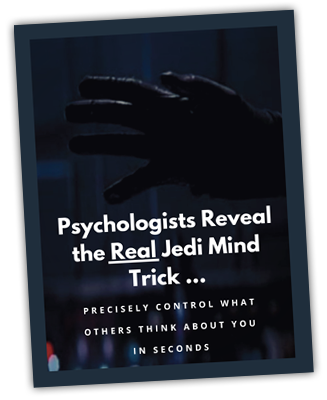 What you’re about to read may not be “the” Jedi Mind Trick, but it certainly qualifies as “a” Jedi Mind Trick. I’ve been studying persuasion for over 40 years. This was brand new to me and genuinely blew my mind. You can use it to instantly change what people (potential clients … potential friends … potential lovers …) think about you.